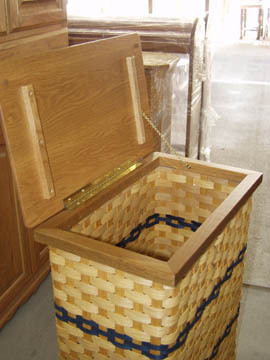 Here is a view of our solid oak and wicker clothes hamper with the cover open. As usual, the Amish have done a quality job, using a brass piano hinge and chain to keep the cover from opening too far, and oak blocking to keep the cover from twisting. The full width of the wicker basket is accessible for putting in your clothes. We’re sure you will agree that this clothes hamper will be an excellent addition to your country themed bathroom. Use your browser’s back button to return to the clothes hamper.